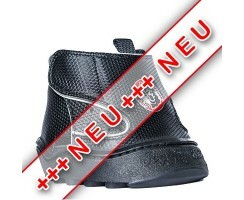 Short description: The EVO BOOT is supporting the hoof mechanism in 4 dimension and offers great adabtability. EVOBOOT 1.0 is the result of professional product development combined with Endurance riding experience that allows riders to apply a hoofboot easily on different hoof shapes. EVO BOOT 1.0 Premium Product Video #1 from EVOHORSE on Vimeo. 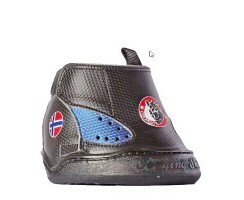 EVOBOOT 1.0 can be used for Endurance riding as well as for pleasure riding. Without the bulb shield the shell can also be used a Glue-On shoe! 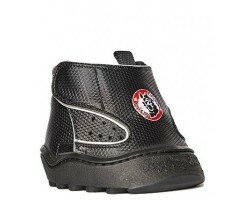 There are a lot of options for professionals to adapt the EVO BOOT to many hoof situations. The EVO BOOT is an extremely intelligent hoofboot promoting the hoof mechanism like no other model. You may have read this already a couple of times before but this boot is really doing it. It?s not only supporting the hoof sole ? it?s flexibel horizontally as well as vertically. Just like the heels of a barefoot horse. And when we say supporting the hoof mechanism we are not only talking about the boot shell, also the shield is very flexible and can spread horizontally and vertically. Exactly as the hoof does in motion and not all hooves and bulbs have a symmetrical shape. The EVO BOOT can be applied very flexibly. Some boots require low heels, some high heels ? with the EVO BOOT it doesn?t matter as long as the heels are not extremely high. Even if your horses hoof doesn?t have a symmetrical shape our boot can be adapted due to thermoplastic material. All you need is a heat gun and 2 minutes of your time. It was very important to create a durable product with parts that don?t have to be replaced permanently. All parts can be removed and exchanged by you easily in less than 1 minute. All you need is a simple Allen Wrench that comes with the boot in a box ! No complicated cable or buckle systems and our locking system doesn?t require any strength to be locked. Additionally 2 locking systems are available ? both come with your ordered EVO BOOT Premium 1.0 ! Code*: What results in 5 multiplied by 4?